Christmas has really started for me now. At school, we've had the Christmas carol service, at my acting company we've had our Christmas party and I've finally broken up from school! I'm really looking forward to a Christmas break with my family and lots of food! This is from my new book, The Great British Bake Off: How to Turn Everyday Bakes into Showstoppers. I was such a avid follower of the show that I had to have the book! So my good friend Beth bought me it for my birthday. This recipe is called English Summer Cupcakes. Preheat the oven to 180oC/350oF/Gas Mark 4. Beat the butter in a bowl until creamy. Gradually beat in the sugar and beat for 4-5 minutes so that it's very light and fluffy. Beat the eggs with the vanilla and then add the mixture a little bit at a time beating well in-between each addition. Make sure you scrape the sides of the bowl to include all the mixture. Sift the flour and salt into the bowl and add the milk. Gently fold together. Spoon the mixture into the cases and distribute evenly. Bake for 20 minutes until golden brown and risen. Leave the cakes to cool in their tins for a couple of minutes, then transfer them to a cooling wrack. In a bowl, beat the butter until it's light and creamy. Gradually sift the icing sugar in and beat in. When all teh icing sugar has been mixed, divide the mixture into 3. For the first batch of icing, colour it red and ice 4 cupcakes using a palette knife. I decorated mine with snow and snowmen. For the blue icing, I used an icing nozzle shaped like a cross and used to create a swirling spiral effect. With last batch of icing, keep a little bit spare as the normal colour. Spread a layer of this on the remaining 4 cupcakes. Colour the remaining icing green. Using a star nozzle, pipe a wreath in short bursts of icing. Using a small round writing nozzle, use some left over red icing (or a red writing pen) to create the ribbon and berries. 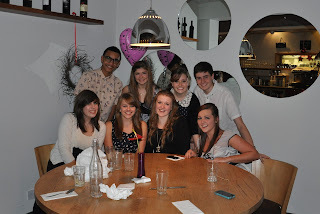 P.S Here's a picture of me and my friends at my 16th birthday meal! Have a wonderful Christmas Nic. Keeeeep Baking! The Mighty Mince Pies Are Back!